A few days ago we released version 0.1 of the smithay crate, its first release on crates.io. On this occasion, let me make a slightly detailed presentation of this wayland compositor library. First of all, let me give some context of wayland, in order to show what problem smithay tries to solve. If you already know about this protocol, feel free to jump to next section. The wayland protocol aims at replacing the X11 protocol as the standard communication mean between graphical client apps and the display server on linux. The rationale for this is that given how X11 is old, has accumulated a lot of debt over the years, and is full of security holes, it's better to just start over with a new protocol. The project has been going for a few years now and adoption is getting pretty good. Notably Gtk/Gnome and Qt/KDE are now almost fully compatible, and some linux distributions have started enabling it by default. Wayland is much smaller and barebones. We could push the analogy to the point of saying that Wayland is to X11 what Vulkan is to OpenGL. For example, a Wayland client is expected to fully handle the drawing of its content, and just hand a buffer to the server via shared memory, while the X11 protocol embeds many drawing primitives (though many recent X11 apps already do it that way anyway). Wayland puts a lot of focus on security and client isolation. A wayland client does now know if other clients are running, let alone accessing their data while any X11 client can hijack the inputs of any other, or read the contents of any window. This is typically the kind of things keyloggers do. Wayland does not have a single implementation. KDE and Gnome both ship their own wayland server, and there is the reference server Weston, as well a some others. 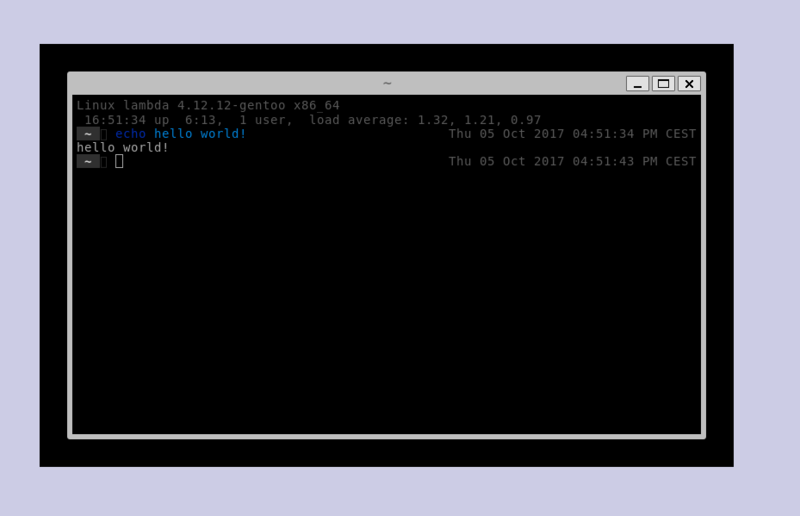 X11 had its de-facto unique implementation Xorg, and window managers connected to the server as privilegied clients. Wayland window managers are the servers. As such, while big projects like Gnome or KDE can afford doing all this in a very personal and customized way, smaller wayland compositors have started to rely on compositor libraries that do part of this job for you. Examples are libweston, wlroots, or the now mostly abandonned WLC. Smithay is a compositor library written in Rust. This first releases brings the most basic building blocks necessary to build a compositor. Smithay is designed in a modular bottom-up fashion: we currently have several independant low-level modules, each managing a very specific part of what "being a wayland compositor" requires. Smithay's user can then use these modules and configure them as they please to set up their compositor. We will consider integrating higher-level modules into Smithay in the future. They would be built on top of the low-level ones, but there is still much work to do with the low-level ones, and this takes priority! Smithay modules are currently organized in two groups: backend modules and wayland modules. The DRM + libinput backend, which allows to start a smithay-based compositor directly in a TTY, like a regular graphical environment. the winit backend, which allows to start a smithay-based compositor as a winit app (and as such as an X11 or wayland client). Being able to launch the compositor as a client helps a lot with the development and debugging. Keeping track of shared memory buffers sent by the clients in the form of a shared memory map (note: this does not handle opengl clients). Keeping track of the client surfaces and their relations to each other. Wayland clients define their window contents by creating one or more surfaces, positioning them relative to each other, and attaching buffers to them. Forwarding inputs to the clients selectively based on current pointer or keyboard focus. The black borders are a graphical artefact from smithay's example, that we just haven't got around fixing yet. How can I run it? If you want to play around with smithay and see what it can do, check out the examples in the github repository. A lot of code is still needed for a compositor built on smithay to work, and there is not nearly enough space in this blog post to paste the code. You can also check out Smithay's documentation on docs.rs. The crate-level docs are minimalistic, but we try to expand on all the details in the documentation of the individual modules. If you are interested, your contributions would be very welcome! Most of the work on the backends don't require any wayland knowledge. We've also started to work on a smithay book. For now it only contains explanations of the wayland protocol itself, but we plan to incorporate detailed tutorials on how to create wayland client apps using the wayland-client crate, and how to create wayland compositors using wayland-server and smithay. We have a matrix chatroom @smithay:matrix.org, which is also bridged to mozilla's IRC at #smithay and to gitter at smithay/Lobby. Feel free to drop by!